Visit or contact the seller of the vehicle. 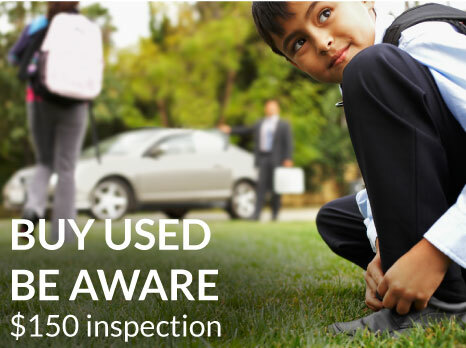 Tell him/her that you will purchase pending a mobile used vehicle inspection. Pass us your contact details, the seller’s contact details and the location of the used car. We will schedule our vehicle inspection with with you and the seller. Before we begin the inspection, we need to take a credit card payment; this can be done over the phone or in person. After the inspection we give you the detailed vehicle inspection report and an estimate of any required repairs. A road test, wheels-off inspection of brakes, steering and suspension, under-hood inspection for electrical, mechanical and fluids issues, cabin systems check, thorough inspection of all vehicle systems, covering up to 110 points depending on the vehicle. The inspection takes 1 to 1.5 hours. If the vehicle is in very poor condition, we’ll document all we can in that time and highlight the most important issues. This service does not allow time for compression testing. We will indicate if we believe engine performance to be compromised and recommend further diagnostic as needed. It’s not worth paying for in every case. We will provide a detailed written report and an estimate for the required repairs. We cover most of the Vancouver area including Burnaby, Richmond, Surrey, etc… for our regular service fee of $29. If the vehicle is a bit further out don’t fret. We do go to Langley or Maple Ridge, we will just charge for the extra distance.